It’s often thought that cats cannot be trained to respond to commands like dogs can, but that isn’t true. 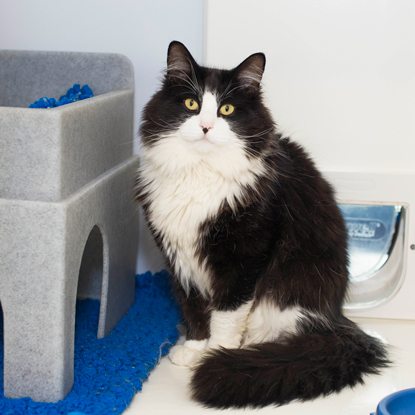 With a bit of patience and a few tasty treats you can teach your clever cat to do all sorts of things, such as respond to their name and even sit or lie down when prompted. Training your cat to sit can be very useful for many things, including introducing grooming and handling, and getting them to stay still while you’re preparing their dinner! Here we are going to teach you how to train your cat to sit using a lure, eg treats. Hold a cat treat between the very end of your index finger and thumb with your palm facing upward. Stand in front of your cat with the treat 1-2cm away from their nose (some cats may prefer it if you sit or kneel so they are not being leant over). Slowly lift the treat up from your cat’s nose. They should then follow it with their gaze and look upwards. Once the treat has been raised by about five centimetres, start to slowly move it a few centimetres back towards your cat’s tail. If they follow the treat with their gaze they should naturally go into a seated position. It may take them a few seconds to figure this out so hold the treat in position if they don’t sit straight away. As soon as your cat is sitting down, say ‘yes’ and give them the treat. If your cat is good at following treats, throw the treat a short distance from them so they move and naturally reset their position ready to start again. If not, do not worry, hand feed your cat then move yourself so they stand up and you can restart the process. If your cat is comfortable with this process, repeat steps 1-6 a couple of times so they learn that sitting on the floor will get them a treat. Once your training sessions are consistently successful, you can gradually alter your hand movement. Put your hand holding the treat in front of your cat and then flick your wrist up to signal for your cat to sit. When they sit, say ‘yes’ and give them the treat. When your cat has mastered this signal, you can start to reduce reliance on the treats. Put your hand into the treat bag/bowl but don’t actually take one out. Still present your hand to your cat in the same way you did before and repeat the actions. If your cat sits, say ‘Yes’ and then get them a treat – you always need to reward them in some way. Once this has worked a few times, you can then present your hand without pretending to get a treat beforehand. Hopefully your cat will still sit in response to your hand signal alone, but make sure you still follow it up by saying ‘yes’ and then giving them a treat. Now they have worked out that sitting will get them a treat, you can start to train them to sit in response to a verbal cue as well as a visual one. Repeat the process as before but one second before you give the usual hand signal, say your chosen cue word. This can be any word you like, as your cat will only be responding to the sound, not the meaning (eg you could say ‘sit’ or even ‘flamingo’ or ‘banana’, anything will work). After repeating this a number of times, your cat will begin to associate the noise with sitting and pre-empt the hand signal by sitting when you say the cue word. Once your cat is comfortably sitting on cue, you can start to repeat this process while standing at a greater distance from your cat, or encouraging them to stay sitting for longer periods. Throughout training, try to keep sessions to a maximum of three minutes long and then give your cat a break. If you can stick to three, three-minute sessions a day, you should hopefully be able to get your cat sitting in response to your verbal cue within seven days. However, it’s important to remember that some cats will take longer to master this than others, and some may not get it at all. Be patient and if you find yourself getting frustrated, take a break and come back to it later. It’s important not to physically force your cat into a seated position, as this will cause them to become stressed and could lead to behavioural or medical problems. Training should be a fun experience for both you and your cat, so always use positive reinforcement and make sure they have the choice to stop if they want to. Come back next week to find out how to train your cat to lie down on command. 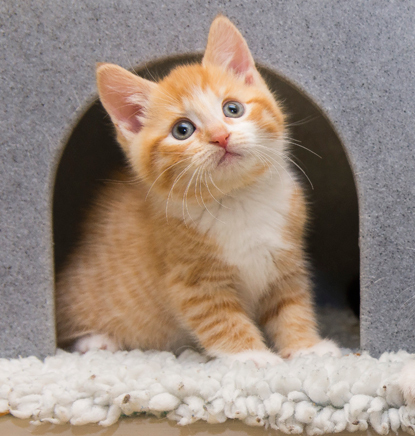 Have you managed to successfully train your cat to sit on command? Let us know in the comments below or on Facebook or Twitter!